Enda Kenny and Eamon Gilmore earlier this year. THE TÁNAISTE EAMON Gilmore has insisted that the government is committed to the reformation of wage agreements in Ireland despite the attacks on Minister for Enterprise Richard Bruton’s proposals from some Labour backbenchers. Speaking to RTÉ’s This Week programme this afternoon, Labour party leader Gilmore said that whilst individual backbenchers were entitled to their opinions there was a necessity to reform the Joint Labour Committee (JLC) agreements and said that the government is committed to the process. Earlier this week it was reported that members of Gilmore’s staff had sanctioned a co-ordinated attack on Bruton’s proposals by Labour TDs who released a series of critical statements on Thursday and Friday. The TDs attacked Bruton’s proposals to cut Sunday and overtime payments for some 250,000 workers in Ireland. Speaking earlier today, Minister for Communications and Labour TD Pat Rabbitte dismissed such claims saying he does not think “there is any question of an attack either co-ordinated or otherwise” on Bruton. It has also been reported today that high-earning lawyers and doctors are likely to be included in the government’s labour reform plans next month. On Friday, Taoiseach Enda Kenny said that he and Minister Bruton were “singing off the same hymn-sheet” despite the issue being largely viewed as the first major disagreement between the coalition partners. Email “Tánaiste Eamon Gilmore insists government is committed to labour reforms”. 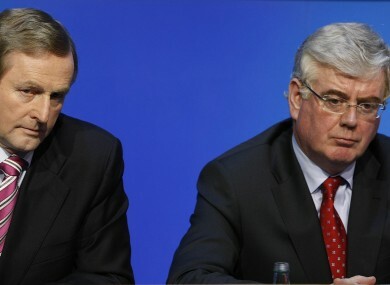 Feedback on “Tánaiste Eamon Gilmore insists government is committed to labour reforms”.